The city of Paris, capital of anti-Semitism-plagued France, will construct an $11 million "European Center for Judaism" by the year 2017. So announced Paris Mayor Anne Hidalgo and Joel Mergui, President of the Jewish Consistoire. 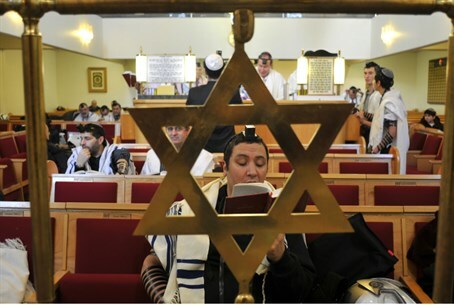 The Consistoire is the body responsible for providing French Jewry with religious services. "I wouldn’t want us to leave for the summer vacation and close this especially tragic year for France and for the Jewish community without being able to provide a note of hope,” Mergui announced, according to a report by European Jewish Press. The new European Center for Judaism will be built in the 17th district of the French capital, where a large Jewish community has developed in recent years. Intended to serve as both an academic center and a cultural institution, the Center will have a synagogue, conference halls, exposition space and offices. A recent poll carried out by the Anti-Defamation League (ADL) finds that anti-Semitic attitudes in France have begun to decline dramatically, apparently in response to the shocking violence against Jews in Western Europe over the past year. The poll also showed that acceptance of anti-Semitic stereotypes by Muslims – not only in France, but elsewhere in Europe – is substantially higher than among the national population in each country. On the other hand, some 20,000 French Jews have left for Israel since 2012, at increasingly higher rates. The number of departures is expected to continue to rise this year as well, although at a lower pace of increase than last year. Just over a quarter of the estimated cost of the new European Center for Judaism will be covered by government subsidies by the government. The city of Paris has leased the land for the center, and Mayor Hidalgo and French Interior Minister Bernard Cazeneuve attended a fundraising dinner last week at the seat of the Paris municipality. "It would’ve been easy to give up on this project and say that Jews are leaving,” said Mergui, but "I want to convey a different message to France and its Jews: We determine our own future."